We examine the consequences and implications of the possibilities that the best-fit m = 4/3 line of the silicon isotopic ratios measured in mainstream SiC grains is identical or parallel to the mean ISM evolution line of the silicon isotopes. Even though the mean ISM evolution proceeds along a line of unity slope when deviations are expressed in terms of the native representation (the mean ISM), the evolution line can become a slope 4/3 line in the solar representation, provided that the solar composition is displaced from the mean ISM evolution. During the course of this analysis, we introduce new methods for relating the solar composition to that of the mean ISM at the time of solar birth. 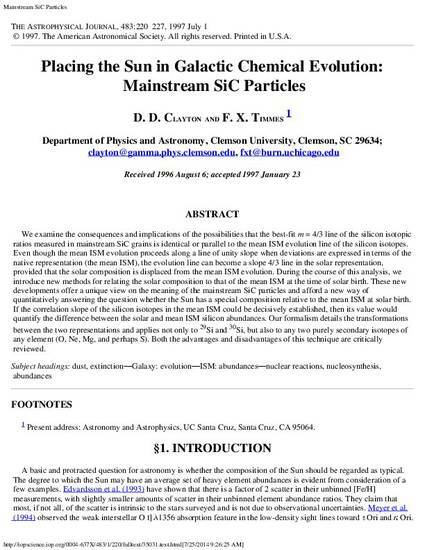 These new developments offer a unique view on the meaning of the mainstream SiC particles and afford a new way of quantitatively answering the question whether the Sun has a special composition relative to the mean ISM at solar birth. If the correlation slope of the silicon isotopes in the mean ISM could be decisively established, then its value would quantify the difference between the solar and mean ISM silicon abundances. Our formalism details the transformations between the two representations and applies not only to 29Si and 30Si, but also to any two purely secondary isotopes of any element (O, Ne, Mg, and perhaps S). Both the advantages and disadvantages of this technique are critically reviewed.